If you have read my post on my experience with VP Bali, you would know, I love to add more to just plain traveling. Initially, I wanted to join a summer school in Malaysia, but it did not work out because of timelines. So, I started looking for summer schools in other parts of the world. That is when I stumbled upon the website for summer schools in Europe. It's an excellent site, to find out schools based on different criteria, like, course type, distance or in-school learning, start date and the number of days, the fee structure, certificate, and university credits. I did a quick research, going through their website, and facebook page to confirm that the school was not a scam before I submitted my application and fees. The application process was pretty straight-forward. You just need to fill in an online form with personal details and information about your education, profession (if any) and the course you are interested in. After you have submitted your application form, you'll get a confirmation email from the school. And soon after that, you'll get a follow-up email with application fees and invoice details. The school gives an option to make the payment in two parts - 50% each. The final payment, however, has to be made before the school starts. It also provides scholarship to exceptional students. For that, you'd require to submit your resume and cover letter along with your application. After you have paid the fees, you'll get application approval and accommodation confirmation. The program runs in 3 terms from July to August with different courses in each term. The school offers a variety of courses to suit your interest, ranging from Business Management to Marketing, to Human Resources, Arts, and Personal Development. If you want to attend the course of your choice, check their website ahead of time, so that you are able to apply before the seats finish and you don't miss the application deadlines. Quick Tip: If the seats are full, and you are really interested in one particular course, then drop an email to the school. They'll try their level best to accommodate you in the class of your choice. The total fee of the course is 750€. It includes the application fee and the necessary study materials. For accommodation, there is an additional payment of 150€. You can, however, choose to stay in any other accommodation of your choice. You can also apply for a merit-based scholarship if you have financial constraints. And if the school finds your application particularly good, they might just offer you one. I actually applied for a scholarship and based on my motivation to join the course and previous experience I was offered a scholarship of 40%. It was a great news for me since I just had to pay 450€ now instead of 750€. The 10 days of school just fly by and before you even realize the term is over. All these days are packed with classes in the morning and fun activities in the evening. The classes start with an introduction to the course and gradually progress to understanding the depths. The best part of the course structure is that even in such a short time, you get an opportunity to actually work on the things that you learn in the class. As for the activities, Linda and Lucie (activity coordinators) make sure that every day the students experience something new and different and local to Prague. These activities include a walking tour to the city's points of interest, dining in different restaurants, going for open-theatre movie night, playing beer pong, picnicking/barbecuing in a park, and so much more. The best part, the activities are not just restricted to the ones mentioned above, since the organizers are always open to suggestions and ready to change plans according to everybody's interest. But again, you don't need to attend all the activities, you can choose the ones that you are really interested in. I'll, however, recommend that you do participate in if not all, most of these activities, because it helps you see the hidden parts and experiences of the city from a local's point of view, and also make friends with the rest of the group. I applied for the course, "Fundamentals of Marketing" but unfortunately, it got canceled a few days before the start day. I was a little disappointed, but it was too late now to cancel my plans since I had already booked my flight tickets and applied for the visa by then. That would be a heck lot of money wasted. Other courses that were available were Business Management, Human Resources, Personal and Professional Development, and Online Marketing Challenge out of which Online Marketing was already full. I then decided to continue with Personal and Professional Development. During orientation, I requested Hank and Lucas (the program coordinators) to transfer me from Personal and Professional Development to Online Marketing Challenge. My roommate was also looking for swapping her course, Online Marketing Challenge with Business Management. Therefore, luckily, I could get her seat in the Online Marketing class. The course was very detailed even though it was just for 10 days. We learned in depth about marketing and the need for it, different techniques to market depending on the product type, understanding the statistics and how to improve them. We had a few guest lectures where we deep dived into the technical aspects of setting up a website. Throughout the course, we worked on two projects - one individual and second a group project. For the individual project, we had to set up our own personal blog and incorporate the technicalities that we had learned during the class. For the second project, the class was divided into groups, in which each group had to set up their website for the product/idea that they had. In addition to that, we had to market our product/idea using different marketing techniques. Q&A was encouraged in the class and everybody participated in giving genuine feedback as each of us progressed through our projects. The instructors were always there to guide and direct in the right direction for both, our personal blog and our team project. The best part of the class was being able to apply the theory that we learned into our project and that too within a time span of 10 days. European Summer School was not just about studies, it was more of a wholesome experience. Linda and Lucie our activities' coordinators had planned 10 days of ultimate fun. The very first day after orientation we went for dinner together where all the students got a chance to interact with and know each other. These fun activities were not just limited to dining and partying together, but also touring the city on foot and bikes, picnicking in parks, going for day-trips and much more. For me, it was a perfect blend of a local and a tourist experience. It is during these activities that you interact the most with other students, especially those who are not part of the same class as yours. So make sure you try to be part of as many activities as possible! PS: The admissions are starting soon. So hurry up and apply early to get a course of your choice. Also, don't forget to mention my name as a referrer. I had been planning something special for New Year’s this time, something that I had not done before in my life. I decided for an end to end solo trip, starting right from planning to execution. I stumbled upon a few places, starting from the nearest cities- Portland, Salem, Eugene (in Oregon) to farther ones like Orlando, Salt Lake City, San Francisco. Seattle being a cold and rainy city, I wanted someplace that was warm and in addition to that had a good number of things to take a tour of, and that is when I decided to visit Orlando. It had warm temperature and a lot of Disney world kind of places. I did a pretty good research but was confused up until I thought of finalizing San Francisco. I don’t remember why it hit me, but I am glad I decided on SF!! I planned to stay in SF for 3 days and 2 nights. I looked at flight rates- the rates were still pretty cheap. Post that, I searched for available accommodations for the time I’ll be there. I planned to stay in a hostel, for two reasons: to meet new people and to stay in budget. Green Tortoise was the best-rated hostel on hostelworld.com. It is by Broadway St and Keary St with good proximity to restaurants, fisherman’s wharf, China town, Telegraph Hill and much more. The only thing that you would need to take care of is that though the hostel had good connectivity to most of the places, it was in a block full of strip clubs. So, if you are uncomfortable with it, choose your stay accordingly. I landed in SF on 30th Dec at 8:15 am. As suggested by the hostel, I took BART train from airport to Montgomery St. station which was $8.95 and approx. 30-45 minutes ride. Montgomery St station is a 15 min walk to Green Tortoise Hostel. BART was the most convenient option for me but you can also take Amtrak shuttle bus or other shuttle services that are available at the airport for additional 10$. 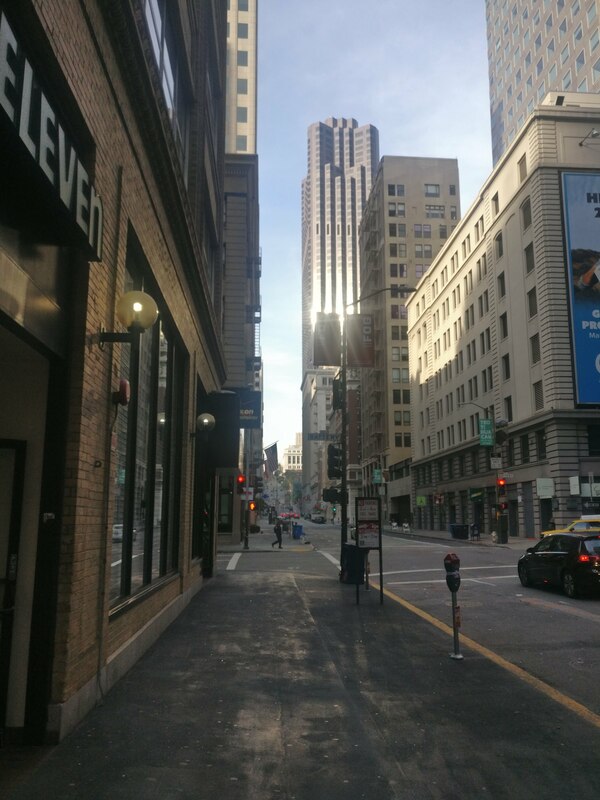 I reached Montgomery St station at around 9 and I was thrilled to see the sunny town with tall architecturally beautiful buildings. From there I walked straight to my hostel appreciating the beauty around me. Now, check-in times for hostels are usually 2:00 pm or after that. It was 4:00 pm for Green Tortoise Hostel. I reached the hostel pretty early, but the hostel staff was very accommodating. They considered me for early check-in and suggested that my room would be ready by 1. I kept my bags in the locker room and had some breakfast (they have breakfast till 10:00 am). After some freshening up, I started towards my first target spot, Coit Tower. It is an uphill climb from Green Tortoise hostel towards Telegraph Hill. It was this place that made me fall in love with San Francisco. There were numerous closely packed pretty little houses on the way towards the tower adorned by the greenery around them. There is a good view of the beach from most of these houses. 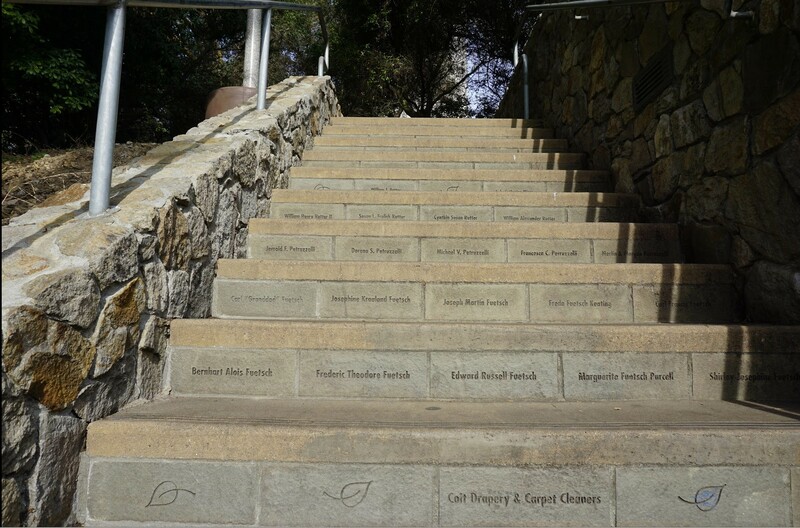 The stairs to the tower had names of different people engraved on them signifying their donation to the restoration of the tower. This set of steps is Filbert Street Steps. There is another set of steps, the Greenwich Stairs that you can take to reach the tower. 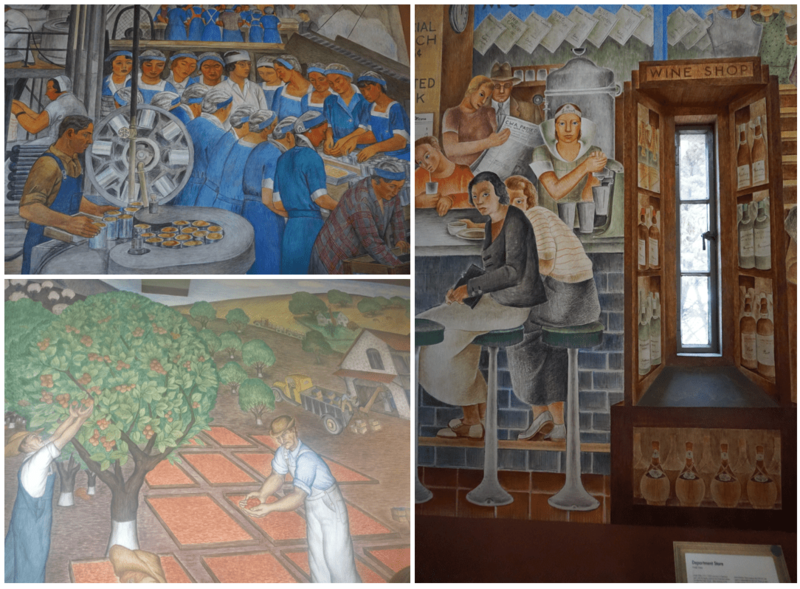 Inside the tower, you’ll see paintings on each of its walls – also known as Murals. A Mural is a kind of art that is done directly on the wall. These paintings depict different aspects of life in San Fransisco and other parts of California. Some of these painters currently take classes in different art schools in and outside SF. The tower itself is a 13-floor tall building that gives a 360-degree view of the city. Ticket for going to the top of the tower is $8 for non-SF residents. You can stay on the top of the tower for however much long as you want (of course unless they are closing). I stayed there for around 15 minutes enjoying the beauty of the city underneath and took some pictures. After coming down, I took a small stroll around the tower enjoying the narrow path along the tower walls. While coming down the tower stairs, I saw an old-aged main selling lovely paintings done by him. 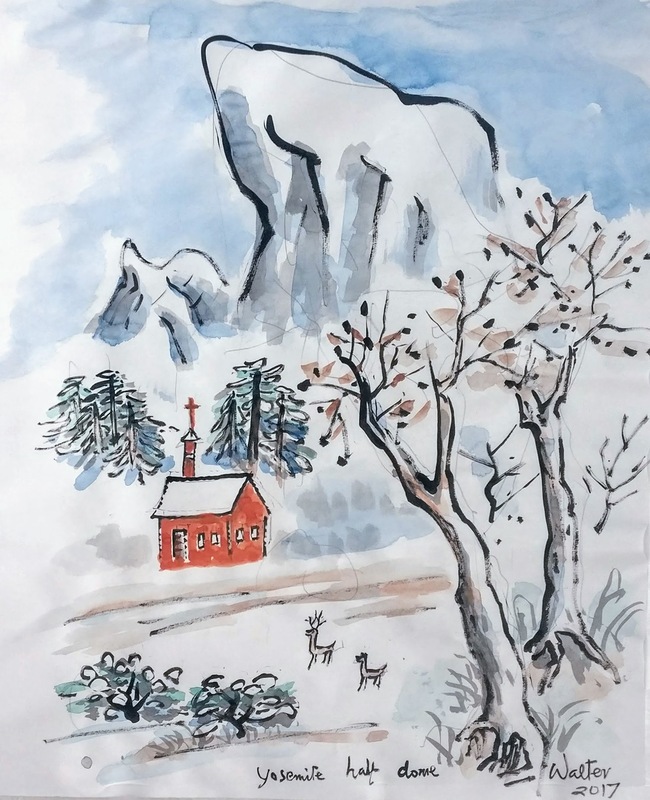 I bought myself one of his artworks, a simple yet so beautiful painting of Yosemite Park (partly complete I guess). 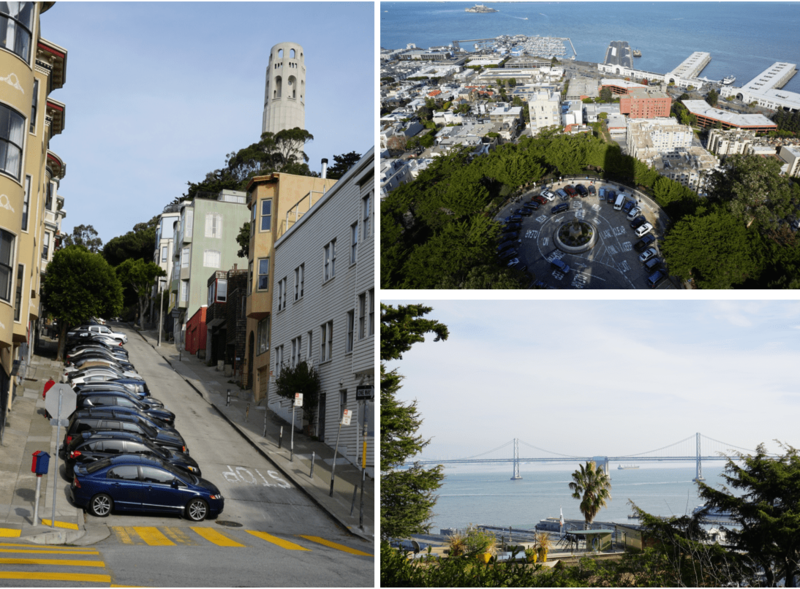 1) Coit tower is 84 years old and stands 210ft tall on the top of Telegraph Hill. It was commissioned by Lillie Hitchcock Coit who left 1/3rd of her fortune to the city as a tribute to the firemen of San Fransisco and her love for the city. 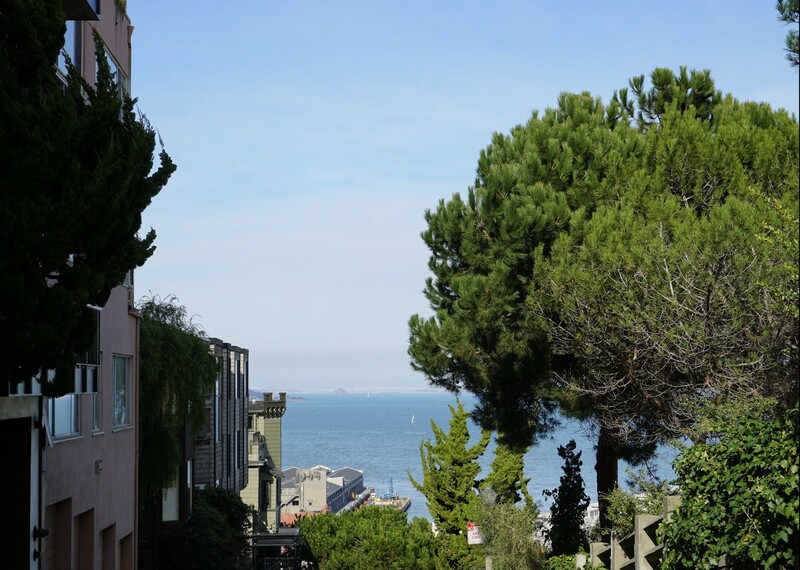 2) The other two famous hills in SF other than the Telegraph hill, are the Russian Hill and Nob Hill. After coming down from the Telegraph Hill, I first went to my hostel and checked into my room and headed for my next spot. I had pre-booked an “Afternoon half day tour to Muir Woods and Sausalito” via Viator in partnership with Gray Line of San Francisco. The tour was to begin at 2:00 pm and it was already 1:30 pm. I rushed to the Gray Line‘s office. I decided to stop by a cafe, Cafe La Taza near their office to get some sandwich and coffee. Apparently, this cafe has a good rating on Yelp, but my experience of both food and beverage was really bad. This makes to my list of places to not eat in San Francisco. SF streets are really busy on weekends because of which the tour bus was late by half an hour. It arrived at 2:30 and all the people in the group got settled in and we started off crossing some of the very famous streets of San Francisco, like Lombard St., Pacific Heights (also known as Billionaire’s row), and the guide telling us about some historical facts about the city. 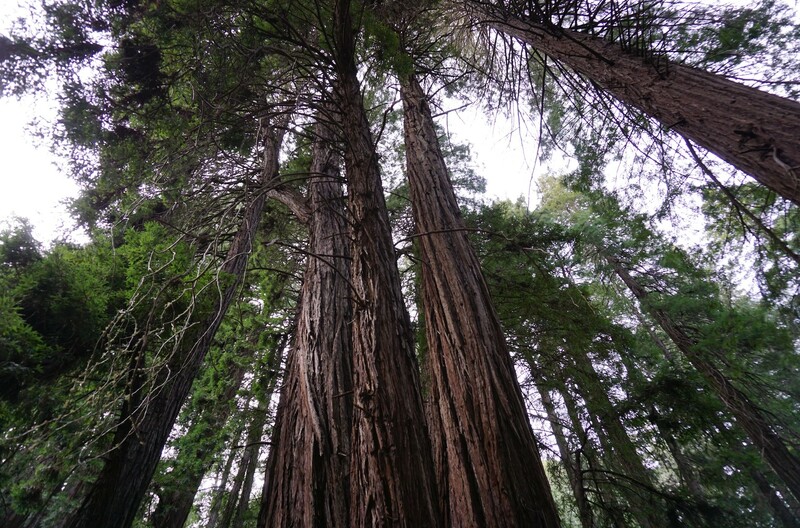 Muir woods is approximately 16 miles from the main city across the famous Golden Gate Bridge. We reached the forest around 3:30 and had 90 minutes to take a stroll in the woods. Muir woods had one of the most spectacular views. These are the giant redwood trees that have their roots intertwined which helps to hold together the soil against winds or floods. There are 2 to 3 trails in the woods, you can take whichever you prefer. All of these go through the whole forest. The best part about Muir was that the area was so dense and yet so quiet. Small Tip💡: There’s a cafe as you enter the Muir woods and washrooms just beside it, outside of which you’ll see a huge queue on a busy day. Better to use washrooms that are just outside the entrance. Key Fact⚠: there is no phone network in and around Muir Woods. You’ll have to travel around 2/2.5 miles till you get the network back. After spending an hour and a half in the woods, I came out to realize that my bus has left. It was already getting dark, the main office had closed and all other people were slowly leaving. With zero network connectivity, I could not make a call to either the tour company or any other person that I might know. Throwing away the idea to walk till I get a network, I hitch-hiked with a family back to San Fransisco. By this time, I was literally starving, so I looked for the best oriental restaurants that would be near my hostel. I found this top-rated Chinese restaurant, Chong Qing Xiao Mian and booked a cab from Pier 39(where the family dropped me) to the restaurant. There was a long queue outside the restaurant and it was already 6. I had planned to reach the hostel by 8 to get a good night’s sleep for an early beginning the next day. So I wandered a bit and stopped at “New Woey Loy Goey“, another Chinese Restaurant. It was full too, but since I was alone I managed to get a seat at the bar. 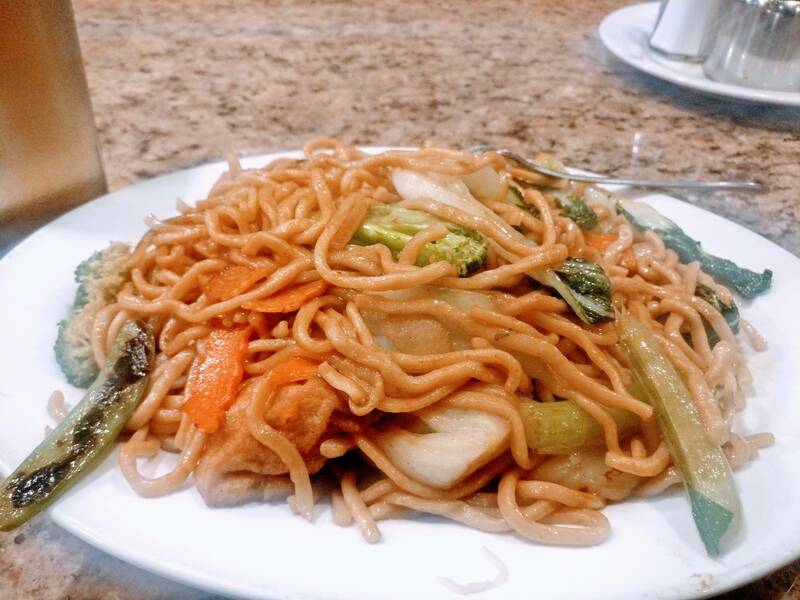 I ordered Vegetarian Chowmein and though the quantity was huge, I did not like the taste of it very much. But it was good enough to satisfy my hunger. Oh Oh, and there was free Chinese green tea served as a welcome drink. After finishing the dinner, I walked to my hostel. On my way, I crossed a group of Chinese people singing and dancing to authentic Chinese music. I stood there listening to them for a while and then continued on my way back to the hostel. I dozed off within few minutes after reaching the hostel.